Dental x-rays, or radiographs, are essential for diagnosing dental disease and other potential concerns. These radiographs display teeth, bones and soft tissue. Analyzing these structures allows Dr. Nick to determine if there are cavities or other dental problems present that are not recognizable to the eye. Radiographs of your child’s teeth are equally as important as visual examination in establishing a thorough and comprehensive diagnosis. Dental x-rays can also be useful in diagnosing early, reversible cavities that can be eliminated with proper home care. 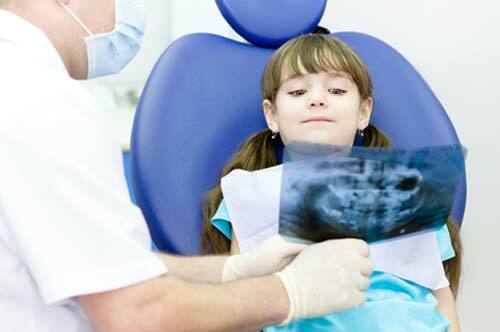 At Lone Tree Pediatric Dentistry, we take digital radiographs. Digital radiographs utilize significantly less radiation than traditional radiographs. Dr. Nick and the team take every precaution to lower your child’s radiation exposure. This includes using proper protective attire and only taking radiographs at intervals recognized by the American Dental Association and American Academy of Pediatric Dentistry as not being harmful to your child.